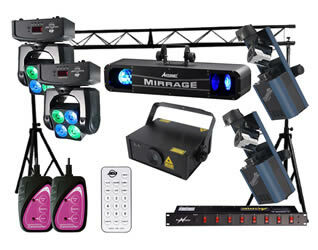 For ease we offer a series of lighting packages to enhance your wedding, party, karaoke evening or event. These are excellent add-ons to the Sound packages on the previous page or to hire on their own. Special rates apply for packages which are supplied for a period of a weekend or two days rather than just a single day at approximately the same rate as the major individual components would cost on a daily rental basis (however daily rates for the individual components still apply if not returned by the due date). This should give you the opportunity to practice and become familiar with the equipment before the event. We also offer suggestions as to suitable options to enhance your set-up. You can, of course, choose anything from the individual items available for hire to tailor your evening as you wish. Alternatively, If you have a theme which none of the lighting options satisfies, we a happy to create a package at special rates to suit your specific requirements. Details of the components supplied in each package can be found on the relevant pages for each type of item. This package provides just one LED light with multiple heads for a party in a small house or hall. It is easy to set up and can fit into a very small space. Requires 1 x 13amp socket. Kam KSM 1100 fogger, to make the light beams visible. 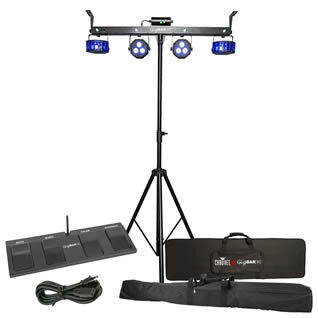 This package provides just one combination LED Moonflower/ Strobe / laser light with three functions for a party in a small house or hall. It is very easy to set up and can fit into a very small space. Requires 1 x 13amp socket. 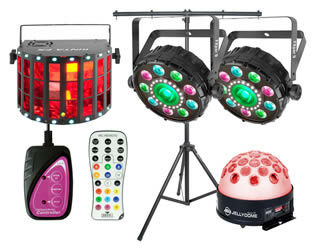 This package provides 3 LED disco lights for a party in a house or small hall. It is easy to set up and should put everyone in the mood to dance. Requires 1 x 13amp socket. 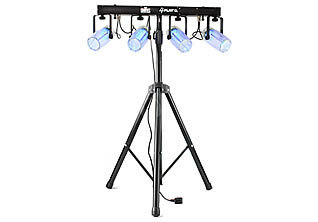 Hazer (Chauvet Hurricane Haze2 or similar) to make the most of the beams that emanate from these lights. 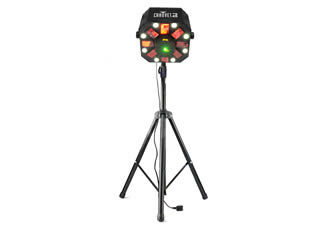 This package creates a big light show in a small to medium sized space with the minimum of effort. It is a four in-one fixture based round a single tripod lighting stand which covers some of the most popular lighting types all hung from a single lighting bar. It’s multiple inbuilt programmes will give lighting excitement throughout your party. Requires 1 x 13amp socket. 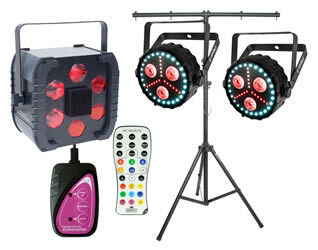 This package provides 4 larger LED disco lights for a party in a large house or small to medium hall, pub or function suite. It remains easy to set up and is bound to entice people onto the dancefloor. Requires 1 x 13 amp socket. Hazer (Chauvet Hurricane Haze 2 or similar) to make the most of the beams that emanate from these lights. 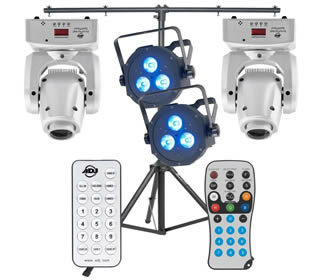 An improved package from the standard offering above providing 4 more sophisticated fixtures, suitable for a party in a large house or medium hall, pub or function suite. It is still as easy to set and is a sure fire floor filler. Requires 1 x 13 amp socket. Chauvet Colorstrip which can add some wash light onto the dance floor for added ambience. For traditional mirrorballs please click here. An elegant package for those wanting stylish lighting for a special event. 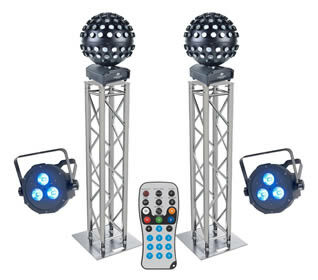 The package includes two modern LED effects that simulate the traditional mirror ball but without the complications of needing to find a place to suspend them – often impossible in smarter venues. The fixtures slowly rotate, scattering beams of white light (or in a colour of your choice in the upgraded package) around the room. 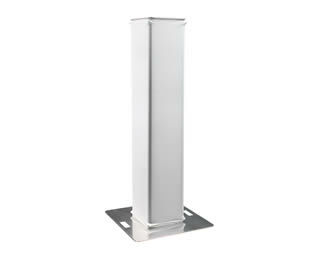 They are positioned on upright truss columns which are internally illuminated by an LED light in each of their bases, which can be controlled by the supplied remote control. If the aluminium truss looks more modern than you are comfortable with, we can also supply a “truss sock” for each, turning the outside white lycra into a screen for the coloured light. Upgrade of fixtures to Kam Stratosphere Ghost with white casing, multicolour light source, and variable speed rotation that can be set to work in tandem. They can also be set to change colours, directions and flash in time with the beat of the music. A pair of Truss socks in white lycra. 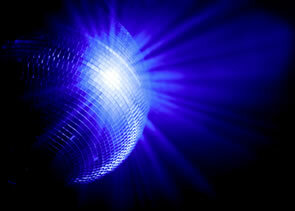 Relive the disco days of the 70s and 80s with this compact and affordable retro style lighting package. 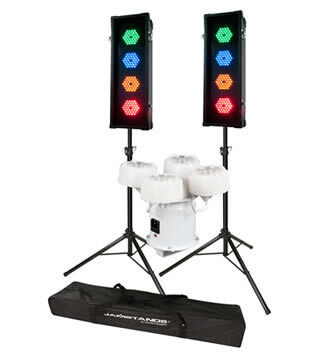 Comprising a linked pair of traditional traffic light style fixtures and a helicopter effect, this package can be set up in a really small space and still add excitement to your old school party. Requires 2 x 13 amp sockets. 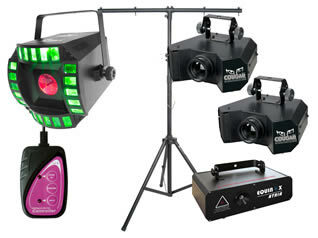 A dramatic package including two tiny moving heads with selectable gobos and colours, that will giving sweeping beams across a dance floor, ideal for a wedding first dance when in slow mode or a more dynamic high energy look when setup in sound to light (all controllable by the included remote control), and two wash lights to add colour to the dance floor. (again controllable for colour and sound to light modes via the remote control). Requires 1 x 13amp socket. A similar set up, to create a larger, co-ordinated show, perhaps one set either side of the dance floor. 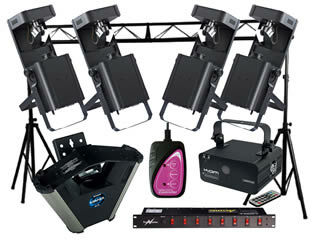 A full featured lighting package with 6 lighting units to create an effect similar to a small night club. This is supplied with a full overhead lighting rig and will require at least two people to set-up. The results, however can be truly stunning, making the effort worthwhile. Suitable for medium to large halls and function suites, or marquees (additional earthing may be required, please enquire). Requires 1 x 13 amp socket, separate from PA and playout. Pair of winched lighting stands to make setup easier. A magnificent package including many fixtures that could easily been found in night clubs or bars, using some industry standard name brands. This is supplied with a full overhead lighting rig and will require at least two people to set-up. Requires 2 x 13 amp socket, separate from PA and playout, or 2 if optional hazer is chosen. American DJ Megabar RC which can add some wash light onto the dance floor for added ambience. Chauvet Geyser to create a CO2 canon type effect with coloured smoke. This package paints the walls with moving liquid projections and patterns. Ideal to create a 60’s and early 70’s feel, but still simply stunning for any event. We are happy to discuss colour schemes required and supply suitable wheels and cassettes to match. Suitable for houses to medium sized halls. 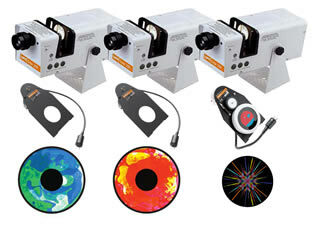 If venue is larger, simply adding further projectors will create sufficient effects. Requires 1 x 13 amp socket (or up to 3 if projectors are to be positioned around the venue). Additional Solar 250 projector, supplied with oil wheel or cassette and rotator. Upgrade from Optikinetics oil wheels to Bubblevision wheels, each wheel. 60mm lens in lieu of standard 85mm, suitable for spreading wider image in a shorter distance. Many other options are possible. Please see Projection lighting page or ask for details.